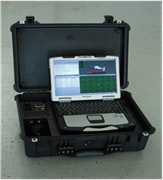 Outward facing command station with bench seat & table for up to 3 air vehicle operators: Ground Control System (GCS) consisting of Air Vehicle Interface electronics, Toughbook CF30 laptop computer running the Ground Control Software & Independent link with hand controller for safety pilot. 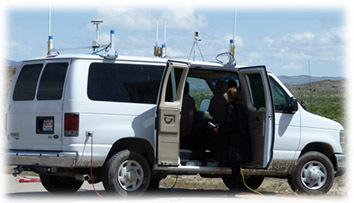 The heavy duty passenger van serves as a self-sufficient mobile ground control vehicle and also as a tow vehicle. The trailer serves as a hauler but also as a field garage for helicopter maintenance and repairs. The trailer also functions well as a base camp for the unmanned helicopter team.